Seafood is supposed to be good for you but thousands fall seriously ill each year from eating a potent toxin found in some fish. Last year, an estimated 50,000 people around the world were stricken by ciguatera fish poisoning (CFP) after eating their favorite fish. That was true the year before, too. And, it was true the year before that. CFP is insidious in that there are no simple methods to test for the ciguatoxins that cause the illness; so people who like fish take their chances at the fish market, and they take their chances in a restaurant. The symptoms of CFP are often frighteningly bizarre. While deaths are rare, people suffering from CFP report experiencing abdominal cramps, diarrhea, nausea and vomiting followed sometimes by neurological or cardiovascular events. Headaches, muscle aches and numbness are common. Other symptoms can include strange sensations, like loose teeth, intense itching or confusion between hot and cold temperatures. The illness can linger for weeks, months or even years. Ciguatoxins are heat-stable, meaning they remain dangerous even after the fish has been cooked. Like many marine toxins, ciguatoxins biomagnify, that is, they become more concentrated in the fish tissue as the toxin moves up the food web. In general, the larger fish that eat the smaller reef fish store higher levels of the toxin, and therefore are more likely to pass on ciguatera to people. In the past, ciguatera was primarily a concern in tropical and subtropical areas, but today fish from those waters are exported to markets across the globe, making the illness a worldwide concern. Mike Parsons, FGCU professor of Marine Science, hopes to shed some light on the murky presence of ciguatera in the marine foodweb. In the sixth year of a grant from The National Oceanic and Atmospheric Administration (NOAA), Parsons is leading a team of researchers studying the fish-borne illness Ciguatera, the most common form of phycotoxin-borne seafood poisoning in the world. 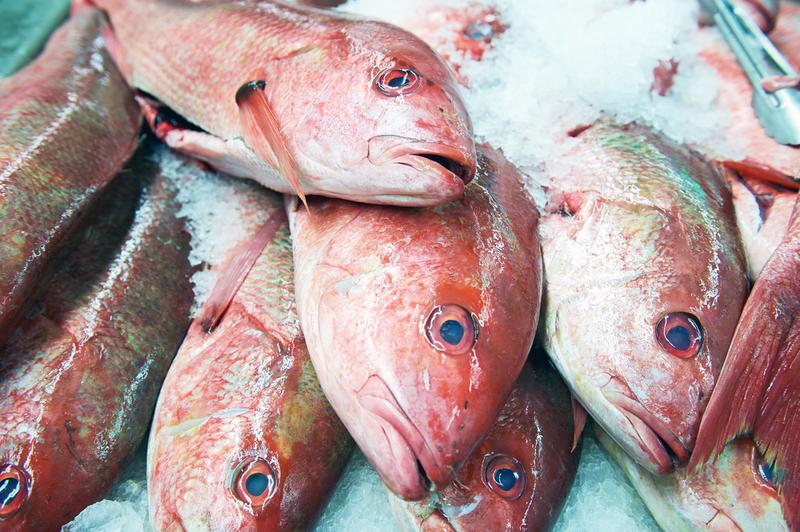 CFP is caused by eating reef fish – grouper, snapper, barracuda, hogfish and triggerfish to name a few – that are contaminated with ciguatoxins produced by members of the dinoflagellate genus, Gambierdiscus. These plankton are singlecelled microalgae that attach to macroalgae, which serve as the diet of many reef fish. Parsons says that at the FGCU laboratory, undergraduate students help identify and weigh algae. They examine samples from the research sites under microscopes and identify them. 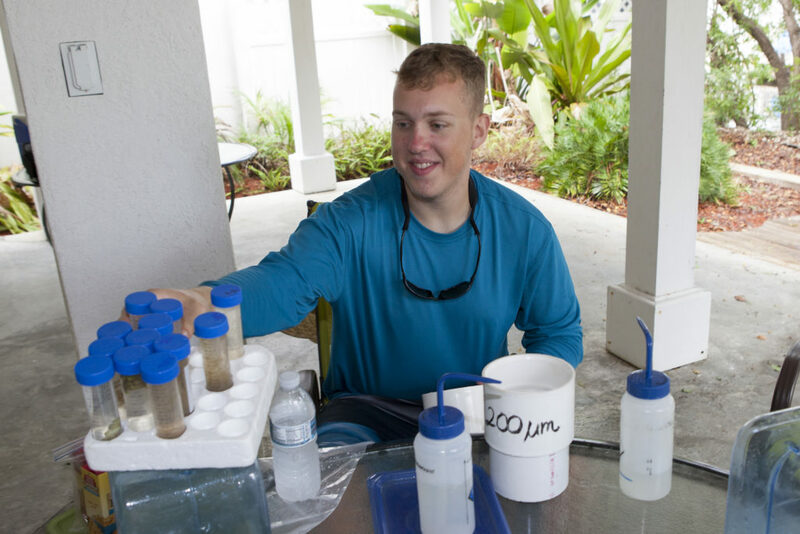 FGCU graduate students conduct toxin analysis on some of the fish and algae samples; other samples are sent to Alison Robertson at the University of South Alabama. “We then tie that information into variables like temperature, wave energy, nutrients – thing like that,” says Parsons. He adds that the Woods Hole scientists are working on new techniques to speed up the process of molecular analysis. A dark, storm cell – suddenly lit by lightning, then settling back into a brooding mass – moves slowly west to east over Long Key, one of the dozens of islands that comprise a coral cay archipelago known as the Florida Keys. Seven miles out into the Atlantic Ocean the sky opens to patches of blue, and two- to three-foot swells rock and jolt the boat anchored over Tennessee Reef, some 20 feet below the ocean’s surface. Walking the deck of the 28-foot Grady White is treacherous. Scuba tanks, buoyancy compensators and fins are piled aft, ready to assemble for the dive. Ice chests are forward – filled with tools for collecting and containers for storing samples of algae, fish collected for examination and, well, with ice. Spears and spear guns are tucked out of the way on the starboard side of the boat. 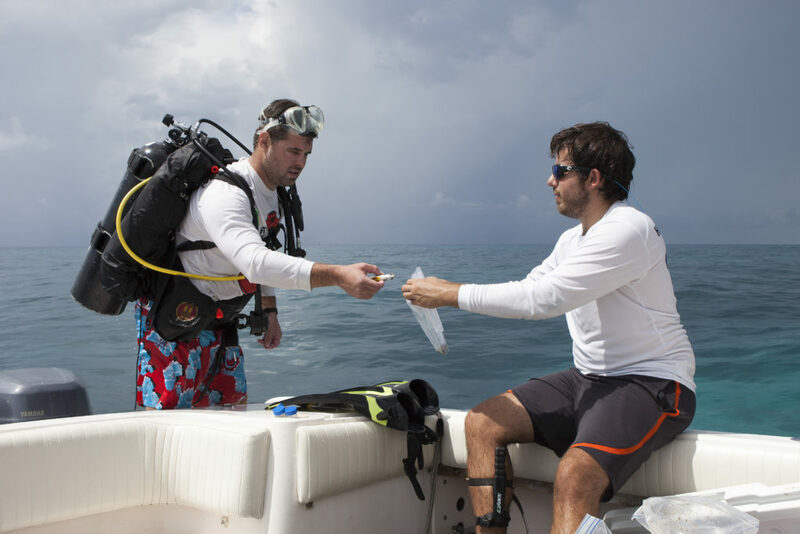 The reef below is one of four primary research sites in the Keys where Parsons and his team study, measure, sample and analyze microalgae and reef fish for traces of the ciguatoxins that cause CFP. Today, Parsons is going over the morning’s dive plan with graduate students Alex Leynse, Adam Catasus and Jeff Zingre. “The visibility should be relatively good,” says Parsons, “so I want to make sure we take time to collect some fish for analysis. Parsons was introduced to ciguatera in 1996 when he was working as a post doc in Louisiana. But it was when he accepted a position as an assistant professor at the University of Hawaii, Hilo that he began his own study of the illness. At that time, despite the fact that ciguatera was the most common form of seafood poisoning in Hawaii, there were very few researchers in the field. 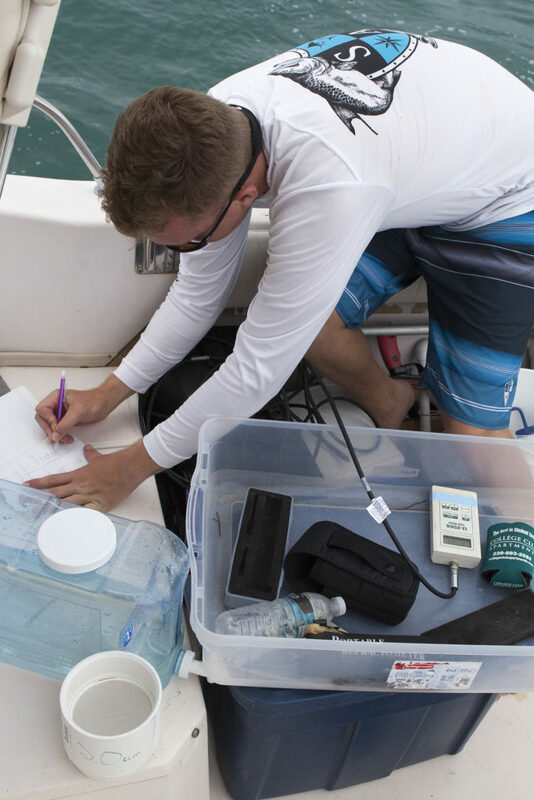 Parsons built a five-year data set on ciguatera while at Hawaii, before arriving at FGCU in 2007, where he continues his research. 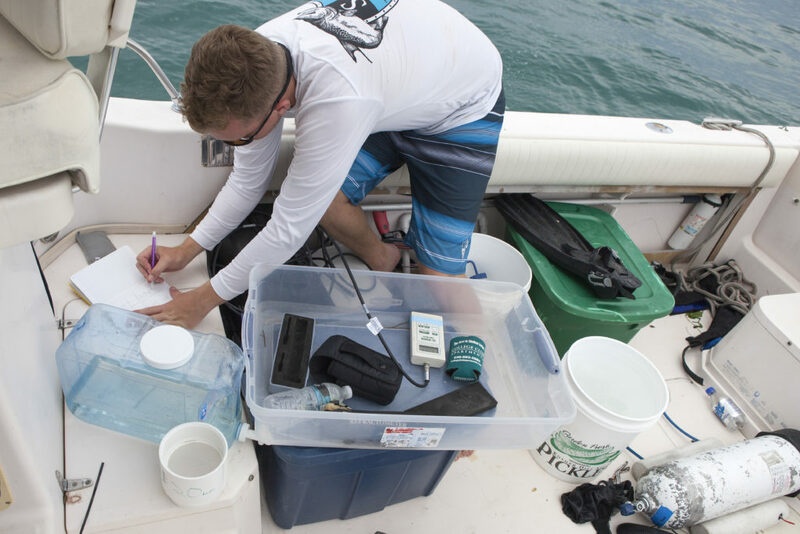 The Florida Keys provide an ideal environment in which to study the reef algae and fish, and, in 2011, Parsons applied for and received a $4-million ECOHAB (Ecology and Oceanography of Harmful Algal Blooms) grant from The National Oceanic and Atmospheric Administration (NOAA). The grant, named CiguaHAB is the largest competitive grant ever awarded to an FGCU researcher. In preparation for writing the grant, Parsons assembled an international team of researchers from universities and laboratories with a focus on the Caribbean region, including the Woods Hole Oceanographic Institution, the University of Texas Marine Science Institute, the University of South Alabama, the University of Veracruz, the Food and Drug Administration Gulf Coast Seafood Laboratory and the University of the Virgin Islands. Tier 1 and Tier 2 research sites were established. The Tier 1 sites are located in the Florida Keys and the Virgin Islands, and are visited monthly. Tier 2 sites are located a little further afield and are visited less frequently. 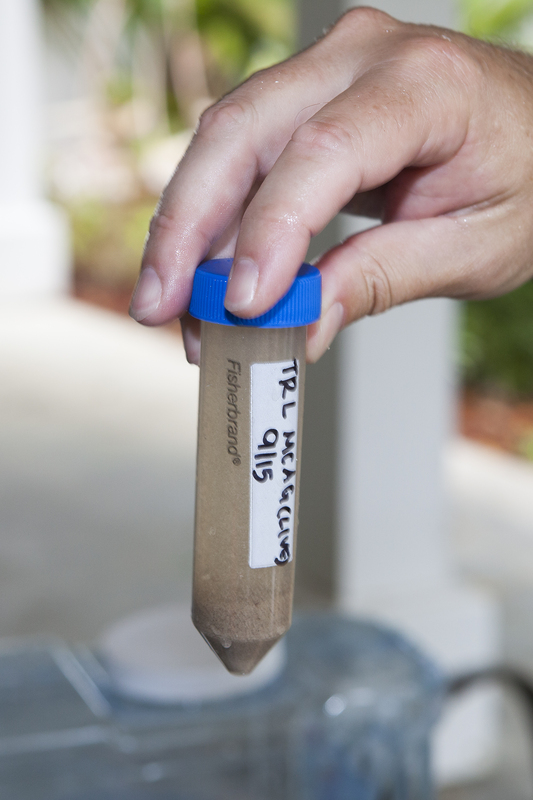 Samples collected at the Florida Keys Tier 1 sites are sorted, prepared and analyzed by the FGCU team, then sent to CiguaHAB partner institutions for specialized analysis. It’s early morning at a near-shore, Tier 1 site, and the water is murky – visibility of about two feet – and shallow. Working at a depth of six feet, the dive crew has had to add extra lead to their weight belts to allow them to hover above the bottom (without bobbing to the surface) and perform their research activities. As with each visit to the research sites, Alex Leynse is first in the water, laying out a transect line across the bottom. The lines radiate out in three directions from “the cage,” a structure that holds artificial settlement surfaces, neutral plates on which algae can grow. The neutral plates are important because they allow apples-toapples comparisons about algae growth between Tier 1 sites. The transect lines serve as a map, of sorts, of the bottom; and Adam Catasus, camera in hand, follows the transect lines, taking photos of predetermined quadrants of the bottom. Comparing the photographs from month to month helps the researchers understand the seasonal differences in growth of structures along the bottom of the test site. This information furthers their understanding of optimal times for algae growth – and, by extension, optimal times for the presence of ciguatoxins. While Leynse and Catasus complete their work, Parsons searches the bottom for algae. 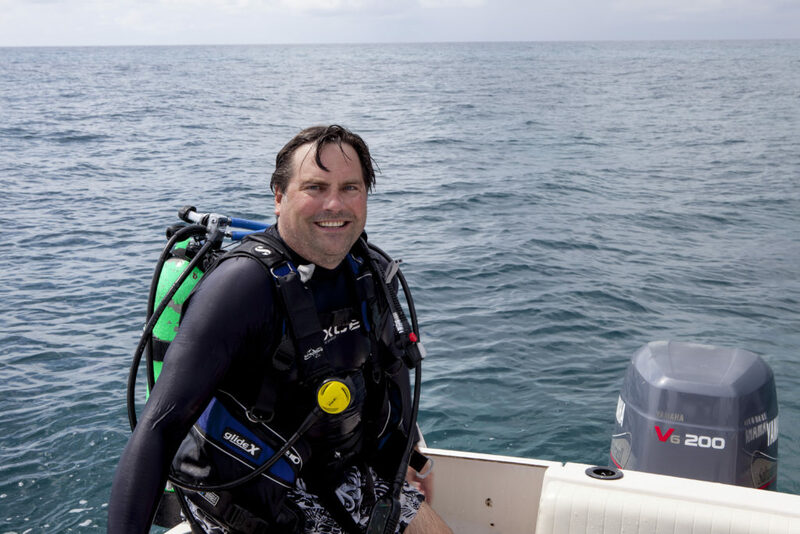 He is looking for epiphytic dinoflagellate communities, and finds these by harvesting the larger algae that are known to host the dinoflagellate microalgae. Once collected, the samples will be shaken and filtered to remove the dinoflagellate, and the Gambierdiscus cells, if present, will be isolated and analyzed in the laboratory. As Jeff Zingre enters the water to collect samples of reef fish for analysis, Parsons explains another dimension to their work. “Our work here is very complex,” he says. “We’re compiling the data that will give us an understanding of the overall marine system at work at our research sites. When we understand the system at work on the reefs, we’ll be in a better position to make predictions about when outbreaks of ciguatera are most likely to occur. We’re finishing up our fifth year of the study now. Once we have a definite understanding of the system, we’ll be able to develop a predictive model that NOAA can use to forecast the likelihood of CFP. That’s the goal for the next phase of our research.” Once that goal is reached, the CiguaHAB research will impact tens of thousands of people worldwide as fewer and fewer people suffer from ciguatera fish poisoning. Ken Schexnayder is writer and poet and the former assistant director of University Marketing and Communications at FGCU. He lives in Bucharest, Romania. Ciguatera: a foodborne illness caused by eating certain reef fish contaminated with a toxin made by dinoflagellates such as Gambierdiscus toxicus, which live in tropical and subtropical waters. Ciguatoxins: a group of marine toxins produced by living organisms, which are the cause of Ciguatera Fish Poisoning (CFP). Dinoflagellate: a plankton (chiefly marine), usually having two whip-like structures (flagella) that allow the cell to move. One flagellum is located in a groove around the body, the other extends from its center. Epiphytic dinoflagellate: dinoflagellates that attach themselves to larger algae. Gambierdiscus: a species of dinoflagellate, some of which carry ciguatoxins that can cause ciguatera. Phycotoxin: toxic chemicals produced by marine algae.